While newspapers from Phoenix to New York in the past few days are describing the loss of jobs in the Arizona mining industry and its impacts on families and communities, the Arizona Daily Star ran a front page story about gold mines in Mexico eager to hire Mexican miners returning home and others with a variety of skills. Non-Mexican citizens need a work visa to work in that country. Both Gammon Gold and Tucson-based Mayo Gold Explorations are looking for workers for mines in Chichuahua and Sonora, respectively. The news story has links for job applicants. A joint state House-Senate committee recommended the Arizona Legislature reauthorize the Arizona Dept. of Environmental Quality for 2 years, rather than the normal 10-year period, and also voted to prohibit ADEQ from enacting any kind of cap-and-trade program not approved by the Legislature. All state agencies have to go through this "sunset" review on a regular basis. The committee had publicly expressed opposition to Arizona's involvement in the Western Climate Initiative, a regional consortium of states that is developing plans to reduce greenhouse gas emissions, especially carbon dioxide. Purpose: To support the National Park Service in its resource management and preservation of cultural, biologic, hydrologic, and geologic features. Purpose: To provide a geologic framework to the Navajo Nation for land-use planning and natural resource management. Purpose: To understand the geology along the U.S.-Mexico border in support of land-use management. A story in today's Arizona Daily Sun in Flagstaff quotes USGS geothermal expert Wendell Duffield as calling the area near Sunset Crater as the greatest potential geothermal energy source in the state. 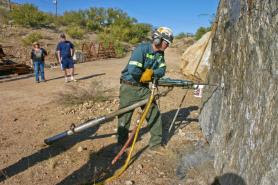 Duffield suggests an 8,000' - 10,000' deep well to test below the Coconino Sandstone which serves as a regional aquifer. 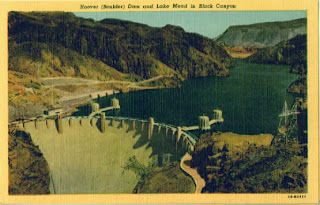 He describes the aquifer as responsible for depriving the region of telltale hot springs or steam vents by carrying the heat laterally many miles away to places like Verde hot springs. Yet, the BLM's regional assessment of areas with the highest potential for geothermal energy, completed ignored the San Francisco Volcanic Field and other promising locales. This may make it harder for companies to explore federal lands in the area because they are not included in the BLM planning. Sunset Crater, the youngest in the state, erupted around 1064 A.D.
Robert Huber over at stratigraphy.net has developed a really cool site "Geoblogosphere News" that aggregates the posts from geo-blogs into one spot. 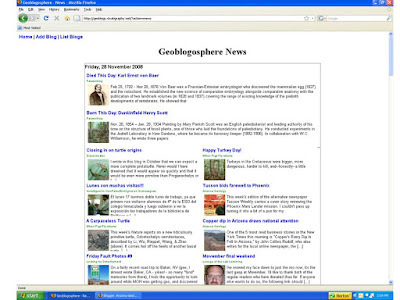 He started with the massive compilation of geo-blogs at geoberg.de but anyone can add their geo-blog to the service. It's only been up for four days, but I can see that this is going to be an incredibly interesting, valuable, and I suspect, popular site. 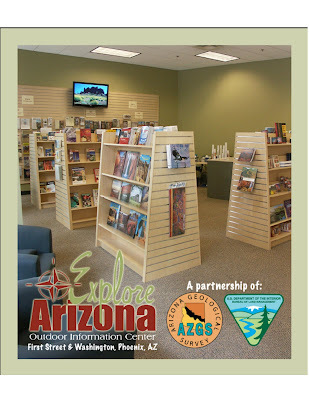 We're holding the grand opening of Explore Arizona, our new P hoenix map-bookstore/outdoor information center next Thursday, from 11:30 am to 1 pm. It's on the ground floor of the Phelps-Dodge Tower at One North Central Ave and Washington St. in the Copper Square area of downtown. We validate for parking in the P-D garage. The center is a joint venture between AZGS for the State of Arizona and the U.S. Bureau of Land Management (BLM), operated by AZGS. We're making Explore Arizona a one-stop shop for all state and federal information and publications on the natural history, natural resources, recreation, and environment of Arizona, as well as carrying a variety of retail products. The full line of AZGS publications are available along with topo maps from USGS, BLM, and USFS, as well as growing variety of technical and popular products from other agencies and publishers. We invite you to stop in see what we have to offer. We've created this without using any state taxpayer funds. It's an entrepreneurial approach to providing greater services and access to government materials through a sustainable business model. It seems like that most of the geology discoveries reported by Arizona scientists are about Mars these days. I see that Carl Weitz with the Planetary Science Institute in Tucson, is one of the authors on a study in the November issue of Geology that found evidence of extensive hydrated silicas on Mars using Mars Reconnaissance Orbiter data. 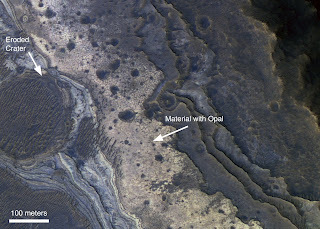 The article was titled, "Opaline silica in young deposits on Mars" which has been widely reported as opals. The significance is that they usually contain 3-10% water, and require liquid water to form on Earth. That, plus the Martian hydrated silicas being only a couple billion years old, suggest a watery environment much more recent than thought. 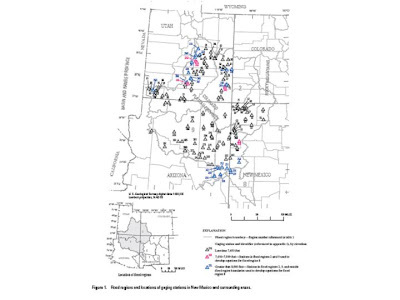 A new USGS report on peak discharge in New Mexico and surrounding areas, actually covers the Colorado Plateau, including a large part of Arizona. Area 9, covering the Plateau south of the Colorado River, mostly in Arizona, has the 3rd lowest envelope curve comparing maximum observed peak discharge to drainage area, of the whole region. This week's edition of the alternative newspaper Tucson Weekly carries a cover story reviewing the Phoenix Mars Lander mission. I couldn't pass up turning it into a bit of a pun for my title. One of the 5 most read business stories in the New York Times this morning is "Copper's Every Dip Is Felt In Arizona," by John Collins Rudolf, who also writes for the local online newspaper, the Zonie Report. It focuses on the economic impact of the sudden and large drop in copper prices on the people who mine and live in Morenci. Coupled with the financial credit crisis, there is a sense of uncertainty and anxiety that was completely unexpected just a few months ago. 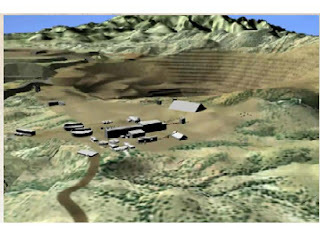 The Tucson-based Morris K. Udall Foundation's Institute for Environmental Conflict Resolution (ECR) says the two sides of the Rosemont copper mine are so polarized that there is no point in wasting everyone's time in trying to set up a process that won't be useful. The U.S. Forest Service brought ECR in recently at the urging of Rep. Gabrielle Giffords to bring the mine opponents and proponents together and to try to get more productive community input into the review process. I had lunch today with Mark Schaefer, the new head of ECR and deputy executive director of the Udall Foundation. Mark didn't let anything slip about their decision but he asked some pointed questions about my perceptions of the dispute. I attended the Congressional field hearing in Tucson a year or so ago and saw firsthand just how angry and intense the debate had become at that point. AZGS mapped the geology around the proposed mine two years ago, and is starting mapping of 3 adjacent quadrangles with co-funding from the USGS, to provide geologic framework data to better constrain groundwater models for the region. Water is one of the most contentious issues about the mine. It's ironic that ECR, which works on issues nationwide has found a fight in it's own backyard to be one of the most intractable. 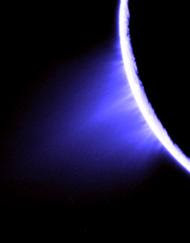 Wayne Pryor, professor of astronomy and geology at Central Arizona College, in Coolidge, is a member of the team that found supersonic geysers of water vapor and ice crystals on Saturn's moon Enceladus are coming from warm, probably liquid water in a shallow underground lake. The report is published in the Nov. 27 issue of Nature. Four jets of water were detected in a giant plume of gas and dust from the south polar region by NASA's Cassini spacecraft. There are contrasting interpretations, but this would put Enceladus on a par with Europa, as the only other bodies with possible liquid water besides Earth. And raises the potential for finding life. The USGS released Circular 1325, "The Landslide Handbook - A Guide to Understanding Landslides," which is intended to be a resource for the decision-making process in land use along with responding to and mitigating landslides. They define landslides in a broader sense, including earth and debris flows, rock falls, lahars, etc. The handbook also serves as a useful technical reference as well. On first look, the diagrams are well done and examples well chosen. The guide covers basic mitigation techniques in a fair amount of detail as well as laying out avoidance strategies. This looks to be an extremely valuable reference for a variety of uses. Thanks to Hobart at geology.com for spotting this. The Arizona Republic this morning has a good story about the controversial and complex land exchange needed to allow the mine to be developed and the economic impact of what's described as the world's largest undeveloped copper deposit. 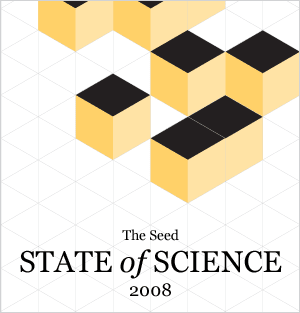 The global expenditure on research and development is roughly one trillion dollars a year (for the purists, the number is $994,424,038,000) according to a review of the State of Science 2008 in Seed magazine. Countries spend on average 2.3% of their GDP on scientific R&D. The U.S. accounts for slightly more than one-third of all expenditures. There are 5.4 million Americans working in science and engineering today compared to 3.3 million a decade ago, and fewer than 200,000 in 1950. I'm still reading the various parts of the review, which is the first of an intended annual series, and each section is compelling. Grupo Mexico offer for Asarco "off the table"
Reuters reports that Grupo Mexico's lawyer says that with the value of Asarco dropping, the company's offer to buy the company including paying off creditors 100% is now "off the table." Copper prices are down about 60% from their highs and Asarco reported a loss of $10.7 million in October. Grupo Mexico is waiting to see what kind of revised deal Asarco might reach with the other bidder, Sterlite, before considering making a new offer. A lot of the science is still to be done as the UA team and collaborators work with the massive data collected over the past 5 months. Whither Resolution Copper with Rio Tinto-BHP merger off? When BHP called off it's proposed takeover of Rio Tinto this morning, it's stock rose 10% while Rio Tinto's dropped 40%. 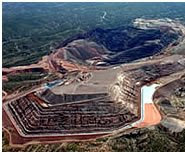 Some analysts are speculating that Rio Tinto may have to dispose of some assets at fire sale prices. 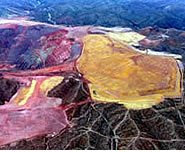 This begs the question of what will happen to the Resolution Copper mine near Superior. Rio Tinto is majority owner of Resolution Copper and committed $652 million this past summer for the feasibility study for developing the 7,000 foot deep mine. It's also dependent on Congress passing a complicated federal-private land exchange. With other companies cutting back their operations due to declining demand for copper and moly, we have to wonder what's going to happen with a huge and very expensive project. Thanks to Jack Caldwell at I Think Mining for posting the news about this. A political analysis (Mining will face formidable foe in Energy and Commerce Chair Waxman) published by Mineweb.com today predicts that Henry Waxman (D-CA) the incoming chair of the U.S. House Energy and Commerce Committee will 'go for the jugular' on key mining issues. 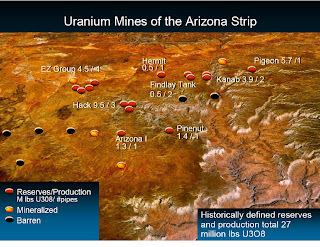 "Among those jugulars Waxman is likely to sink his teeth into are the domestic uranium industry, particularly those exploring on Navajo Nation lands. A year ago, Waxman, the chairman of the House Committee on Government Oversight and Reform, held hearings on what he called 'a modern American tragedy,' the consequences of radioactive pollution from uranium mining and milling on Navajo Nation lands, which lie within the states of Arizona, New Mexico, and Utah." "Waxman has also has argued that new coal-fired power plants should not be permitted unless they capture and bury their green house gases." They suggest seven priorities, including cutting greenhouse gasses, adopting a market approach, stepping up energy efficiency, reducing oil imports, encouraging energy research, aiding low-income consumers and promoting green jobs. UA planetary scientist Richard Greenberg says the oceans of Jupiter's moon Europa hold twice as much liquid water as all the oceans on Earth combined, in a new book, "Unmasking Europa: The Search for Life on Jupiter's Ocean Moon." Greenberg says the moon also has all the ingredients for life - heat, organic molecules, and oxygen. 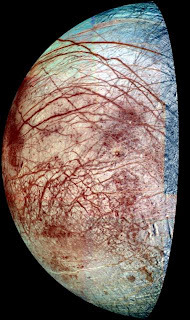 "Not only is Europa probably one of the best places to look for extraterrestrial life in the solar system, it may be an easier place to look than thought," Greenberg said in an interview. The U.S. Department of Energy released its 2008 Carbon Sequestration Atlas II of the United States and Canada, which documents more than 3,500 billion metric tons of carbon dioxide storage potential in oil and gas reservoirs, coal seams, and saline formations. 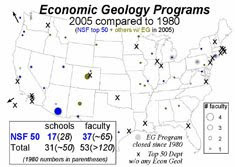 Arizona is a member of both the Western and Southwestern regional partnerships that are identifying sources and potential geologic sinks for CO2. The Western partnership (WESTCARB) shows large saline reservoirs [yellow] in the Colorado Plateau region of Arizona [top], while the Southwestern regional partnership show nothing in this region [bottom]. The other potential reservoirs for CO2 in Arizona are coal beds in the Black Mesa field also on the Plateau. WESTCARB is preparing to drill a test well on the Plateau near the Cholla powerplant to see if deep saline beds are capable of holding significant amounts of carbon dioxide. Given what we know from other wells in the region, that is not a given. The nation's science community has never been as engaged in a presidential campaign as we have in the past year. Similarly, the geosciences and other science domains are weighing in early and prominently in offering advice and assistance in the transition. The Christian Science Monitor summarized the reasons for this in an editorial on Thursday. They note that, "Nearly all the great issues facing Obama involve science or technology as part of the solution." They conclude that, "With Obama receiving so much input from so many sources, the next White House science adviser will best serve as his "options czar." He or she should sift through the blizzard of data and ensure that the president has before him viable choices based on sound science." The UA's education and public outreach (EPO) program for the Phoenix Mars Lander is being hailed as the most successful such effort in the history of Mars missions. By conservative estimates, UA says the Phoenix EPO reached between 50 million and 60 million people in just the past year alone. EPO director Carla Bitter [right] wrote one of the many blogs about the mission. Her blog, "Interstellar Storyteller," offers insights into communicating real science in real time here on Earth about the daily happenings on Mars. Raul Grijalva as Sec. of Interior? Politico.com is reporting that Tucson congressman Raul Grijalva [right] is emerging as a top contender to be Secretary of Interior in the Obama administration. 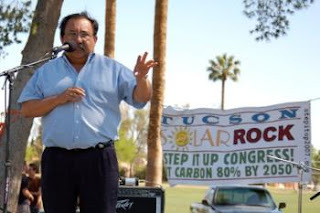 Rep. Grijalva is chairman of the House Subcommittee on National Parks, Forests and Public Lands — and was just tapped as the new co-chairman of the Congressional Progressive Caucus. Recently, he's been getting a lot of attention for his efforts to stop uranium exploration near the Grand Canyon. The Interior Dept. includes the USGS, BLM, National Park Service, Fish & Wildlife Service, MMS, and other agencies. A friend in Houston just sent me a link to Oobject, a Website that compiles sets of pictures of all kinds of strange and funny things, such as the best cardboard Halloween costumes or the strangest floating buildings. 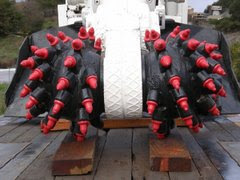 One that caught my attention is 'terrifying mining gear' - chosen, it appears, based on the number and size of drilling bits on continuous miners and such. A few look like robotic dinosaurs with bits instead of teeth and claws. I saw some of these or their cousins, at the MinExpo in Vegas not long ago. They all attracted crowds. "Firstly, it would probably be felt lightly to strongly throughout western and central Arizona. 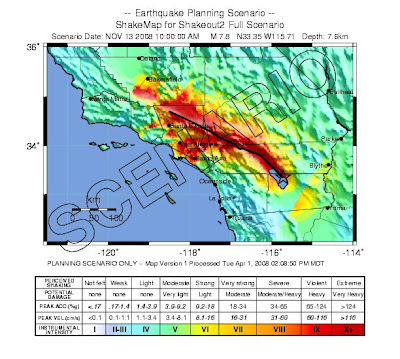 Secondly, the rupture will start along the Salton Sea near Bombay Beach and rupture northwest, past Indio into and through the San Bernardino Mountains. 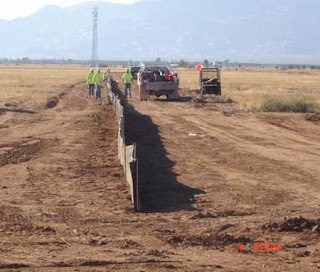 Thus, it will likely sever or damage for days or longer most physical connections to Southwestern California from Arizona. These include: aqueducts, Interstate Highways 10 and 15, rail lines, fiber optic communication lines, oil and gas pipelines, and electrical transmission lines. The damage will be greatest for these connections near Indio and in the San Gorgonio Pass. Thirdly, and most importantly, it will be a regional catastrophe which will significantly disrupt business and social connections. Arizonans will be called on to help our friends and relatives there." Ramon is a member of the Southern California Earthquake Center, which is doing the most sophisticated modeling of regional fault behavior. In the midst of the doom and gloom in the metal markets, Augusta Resources announced the other day that their proven and probable reserves (Cu, Mo, Ag) at the Rosemont mine have increased 14% to just over 616 million tons of ore. In addition, they calculate that the amount of waste rock that has to be removed for each ton of ore has dropped by 16%, which will translate into lower costs. The astronomer who was instrumental in ousting Pluto as a planet will tell that story Friday night at the University of Arizona. The debate is still being argued in scientific circles. 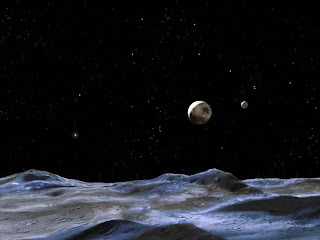 Mike Brown, from CalTech, speaks on “How I Killed Pluto and Why it Had it Coming” at 7:30 p.m. Friday at the UA's Integrated Learning Center, Room 120. The talk is free to the public. The major funding announced yesterday for the Institute for Mineral Resources at the UA is going to build on the schools already national leadership position in mining engineering and economic geology. Just look at the size of the Arizona programs compared to others in the U.S. in the maps above [credit, IMR-UA]. 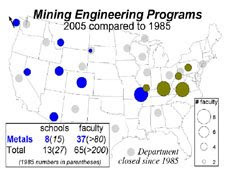 What's so important about the Science Foundation Arizona and industry support of the IMR is that nationwide we have lost 5 of 13 mining engineering programs and 14 of 31 economic geology programs in our universities. That increasingly puts the nation at risk in dealing with the exploration, development, and impacts of mineral resources. Outstanding women scientists are showcased in the current issue of Phoenix Woman magazine, including two who work in the geosciences. 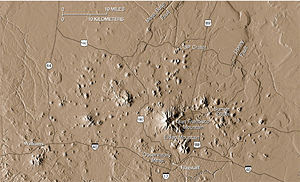 Nadine Barlow [top], an associate professor in Northern Arizona University's Department of Physics and Astronomy, studies Martian impact craters and is chair of the Mars Crater Consortium, an international organization of scientists interested in Martian impact craters. Lynda Williams [bottom], is a an associate research professor of geochemistry in the School of Earth and Space Exploration at Arizona State University. She works on the interaction of clay minerals and microbes and is studying antibacterial clays to determine what makes them behave that way. More amazing Mars news out of the University of Arizona. 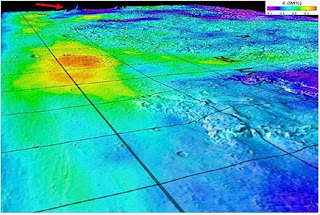 UA planetary geologist James Dohm and co-authors report that the Gamma Ray Spectrometer onboard NASA's Mars Odyssey found evidence that oceans once covered about a third of ancient Mars. 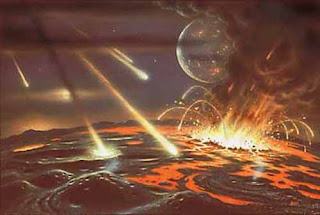 The instrument's data on potassium, thorium, and iron, indicates where the elements would have been eroded from the highlands and deposited in a large sea early in the planet's history. UA Geosciences Dept. chair Karl Flessa passed along the story of how they picked up a brand new, still-in-its-wrapper $200K mass spectrometer for $16K on eBay. 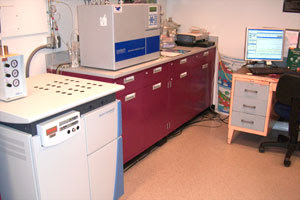 Department engineer Dave Steinke was doing his regular scrounging online for electronics and found the new Finnegan Delta-V mass spectrometer [right, a similar machine at the Univ. of Hawaii], which had been lost in shipping to its original buyer. The insurers paid off the loss but it was found later and sold as lost property on eBay. Dave Dettman used his lab funds to make the winning bid, "after checking and double-checking that the title was clear and there would be no consequences from the manufacturer." 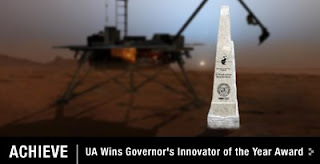 The University of Arizona won the Governor's Innovator of the Year Award [right] in the academia category for leading NASA's Phoenix Mars Mission. In the past few weeks, the Phoenix Mars Mission has been given the 2008 Popular Mechanics Breakthrough Award for innovation, the 2008 Civil Space Award from the California Space Authority, the 2008 National Space Club Astronautics Engineer Award, and Popular Science magazine's 2008 "Best of What's New" Grand Award in the aviation and space category. The Governor's Celebration of Innovation recognizes companies, individuals and academic organizations that demonstrate excellence in innovative technological advancement. Planetary geologist Bill McKinnon from Washington University was sitting in front of me last night on a flight from Tucson to Denver. Bill and I know each other from the early '80s when we both were working on the Voyager mission to the moons of Jupiter. Bill's continued focusing on the structure and tectonics of icy satellites in the solar system. He fired up his laptop and we spent much of the flight looking at images collected just a few weeks ago by the Cassini spacecraft from an altitude of only 15 miles. Resolution was as good as 10 m or so. Enceladus is getting lots of attention because of jets of water blasting out of areas within certain sulci (levee-bound grooves) at the south pole. Bill pulled up infrared images showing hot streaks that looked like the magnetic stripes in the Earth's oceans. The similarity is not just coincidence. Bill's opinion is that the sulci may be spreading centers resulting from internal convection generated by tidal forces. The picture above shows what we both agreed look like fold and thrust belts. Bill pointed out the shapes and patterns suggestive of transform faults - look at the bluish-green shading in the center of the photo above. Unfortunately, we had to shut down the laptop as we came in for landing, but what a trip! One of the reasons I like geology is the exploration and sense of discovery. During my career I've seen the exploration of a good part of the solar system and amazing discoveries that just keep on coming. 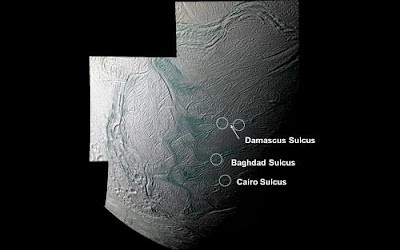 update 11-21-08: Scientific American has a feature story on Enceladus geology-tectonics in the November issue with a good set of photos. No Arizona power plants affected by greenhouse gas ruling? A decision by the Environmental Appeals Board effectively halts all new coal-fired power plants, at least until EPA comes up with a nationwide plan for regulating greenhouse gases, including carbon dioxide. The Board sent back an appeal to EPA on permitting for a coal-fired power plant in the Uinta Basin in Utah that is still being analyzed. But first reports are that 100 new plants are on hold across the country. The expectations are that new greenhouse gases regulations will make coal power more expensive, resulting in renewable and alternative energy sources (including geothermal) more competitive. There are coal-fired plants proposed in New Mexico, Utah, and Nevada, but the last one proposed in Arizona, the Bowie power station [right, construction photo 11-14-08. Credit SoutWestern Power Group] was redesigned to burn natural gas as its fuel after opposition rose over using coal. My sense is that the ruling does not affect the 400-MW Springerville power plant under construction now in eastern Arizona. There's a fascinating video interview with author Robert Hazen. *Robert M. Hazen, Dominic Papineau, Wouter Bleeker, Robert T. Downs, John M. Ferry, Timothy J. McCoy, Dimitri Sverjensky and Hexiong Yang (2008) Mineral evolution. American Mineralogist. 93:1693-1720. 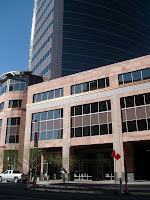 The University of Arizona scored two wins fromPopular Science magazine for "The Best of What's New '08." 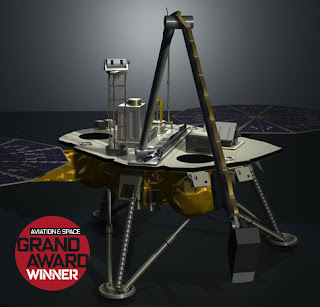 Popular Science gave the Grand Award in Aviation & Space to the UA's Phoenix Mars Lander [right, credit Popular Science], which ceased operations last week as the craft's power ran down in the Martian winter. The Large Binocular Telescope was also cited in the Aviation & Space category. The magazine noted the LBT has 10 times the light gathering power of the Hubble space telescope. Is there a deal in the works for Rosemont Copper?